As we look forward to the final exhibition game tonight and the start of the regular season tomorrow, we’re being hit with nothing but good news on the eve of what should be a fantastic season. So like any good Dodger fan would ask, what could possibly happen to make us rue feeling so positive? I’m sure we’ll find out soon enough. For now, nothing but good news. I was joking, mostly, but even I thought I’d get more than 6 hours of it before finding out that Clayton Kershaw was going to land on the disabled list, which he did after feeling something in his upper back earlier today. That he felt something is certainly not good news, but then, this doesn’t feel like it’s really going to have as much of an impact as you would think when a team puts their ace on the DL barely more than 24 hours before the season starts. Why’s that? 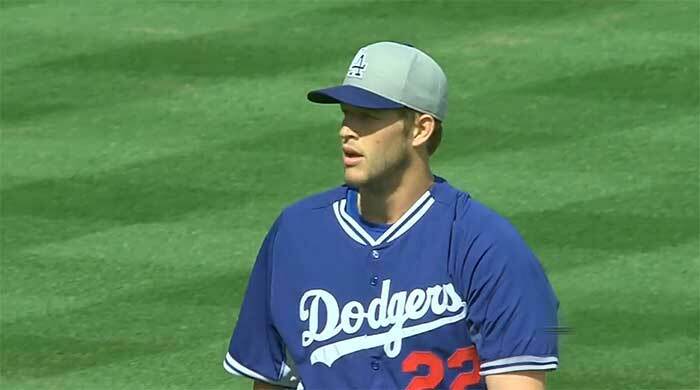 Well, we already knew Kershaw wasn’t pitching against the Padres. Hyun-jin Ryu, Zack Greinke, and Dan Haren were going to start the three games before Kershaw went on the DL, and they’re still starting them now. We also know that this is the best possible time to put someone on the 15-day disabled list, because it’s already been a week since Kershaw pitched in Australia. That means that this is more of an eight-day list than a 15-day issue, since he would be able to return on April 8 (the 7th, really, but the Dodgers are off that day). It’s much too soon to know if Kershaw will actually be ready to come off the DL that day, but the point is that he could, so we should probably cool it on the “15-day” stuff, even though that is the proper name of the list. There’s also this: with Jose Dominguez optioned to Triple-A, as expected, the roster is basically set without having to make that choice no one wanted to see between Brandon League and Chris Withrow. (“Choice,” he says, as though there was any chance that it was anything other than Withrow going down.) No, having Withrow in the pen is absolutely not worth not having Kershaw in your rotation. But for a few days, at least, it’s a decision you can avoid. Also, as every Don Mattingly quote has indicated, this prevents Kershaw from trying to push through the pain. (And if you’ve read anything I’ve written at FanGraphs lately, the fact that Kershaw was honest about what he was feeling is such a great, great thing, that cannot be overstated.) Not having Kershaw right not is a huge bummer; not having him for weeks or months were he to aggravate it would be far worse. Really, the main roster impact here is that game on Saturday, April 5, where everyone hoped Kershaw would be able to start. Now, it’s going to have to be Paul Maholm doing his best Chris Capuano impression, or Josh Beckett being activated off the disabled list. Neither option is ideal; then again, some teams have multiple pitchers of that skill level already in their rotation, and most teams don’t have a two-win head start headed into the season. Again, putting the best pitcher in the game on the disabled list because he’s hurt is never going to be a good thing. But from all indications, this is a minor thing, one that has nothing to do with his arm, and one that doesn’t impact the team immediately as much as you might think it would. If Clayton Kershaw is ever going on the DL, that’s the way to do it. Previous So Much Good News. Too Much Good News?